Garmin’s top of the line smartwatch, the Garmin Fenix 5X, is undoubtedly a beast of a device. The watch features a multitude of functions for serious outdoor enthusiasts. One of its main features is its pre-installed maps that accurately guide users to their desired destinations. The Fenix 5X is also an advanced sports tracker with a myriad of built-in sensors. Users can also use it as a sophisticated smartwatch by enabling smartphone notifications. The top-end model is a bit more expensive than its lower-end siblings, namely the Fenix 5S and the Fenix 5. However, those who are looking for a GPS smartwatch that can do it all will want to consider purchasing the high-end model. The Fenix 5X feels absolutely premium. The watch’s exposed screws, metallic build, and sturdy heft all suggest a quality product. Users can also opt to get either a silicone strap or the watch’s more rugged 51mm metallic strap. The 5X comes standard with a sapphire glass screen. This means that the watch can withstand any kind of abuse and it is immune to minor scratches and dings. Garmin has also built the watch to handle any kind of weather condition. This is evident in its water resistance rating of up to 100 meters. The Garmin Fenix 5X GPS smartwatch is jam-packed with a multitude of features. Onboard sensors include built-in GPS, a barometric altimeter, gyroscope, thermometer, and an optical heart rate monitor. Runners will appreciate the watch’s ability to track different running metrics. This includes metrics such as cadence, vertical oscillation, stride length, and ground contact time. Aside from running, the Fenix 5X can also function as an advanced tracking watch for sports such as swimming, golf, biking, and different workouts. As previously mentioned, the Garmin Fenix 5X comes with built-in colored maps. Users can use the map to track down different points-of-interest locations depending on where they are. The navigation system basically functions like the advanced navigation systems found in modern cars today. The watch’s built-in barometric altimeter also alerts users of any possible changes in the weather. Those who want to use the watch as a standard smartwatch will also find no issues in pairing the device with their smartphones. With so many features on tap, the Garmin Fenix 5X still boasts an amazing battery life. In fact, the watch can survive up to 20 hours of full GPS navigation and up to 35 hours when in Ultra Trac mode. The Garmin Fenix 5X may be a bit pricey for most people. However, those who are looking for a device that can basically do it all may find it well worth the price. 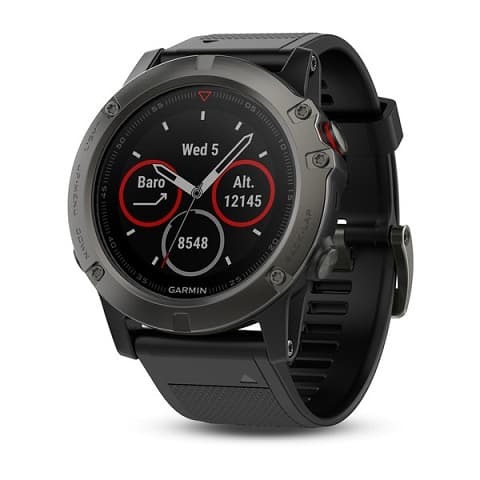 For those with the cash to spare, getting the Garmin Fenix 5X will be the right decision. With a long-lasting battery, great design, and an enormous list of features, the watch is definitely hard to beat. Garmin also constantly releases software updates, which means that users will be able to enjoy their device for many years to come.